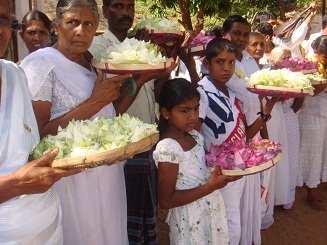 On the 14th May, 2011, Sarvodaya’s partnered with the Siseth Foundation to celebrate the 2011 Vesak celebrations. Sarvodaya’s founder, Dr. A. T. Ariyaratne was invited to lead a special meditation program followed by a lecture on universal cooperation. 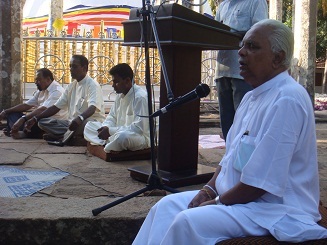 Held at the Noble Mihinthala Ambasthala Dagaba (a Stupa in Mihinthala area of Sri Lanka), the event was held to commemorate the 2600 Sambuddhathwa Jayanthi, the 2600th anniversary of the Buddha achieving enlightenment. 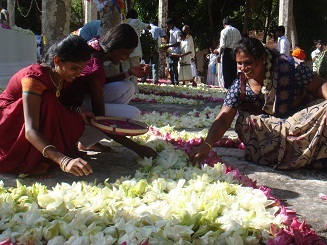 The event saw hundreds of people come to place Nelum Mal, the lotus flower, which has significance in most Asian religions, as an offering to the Stupa pagoda, a symbol of Buddhism’s arrival in Sri Lanka. Over 100,000 flowers were offered at the ceremony. The program was also to celebrate the launching of the ‘Universal Humanity Echo’ concept to the country and the world. 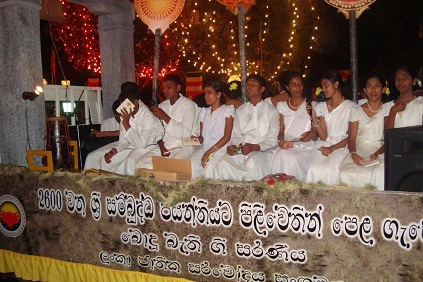 For the fourth year in a row Sarvodaya’s Vesak celebrations also extended to Colombo and its Moratuwa Headquarters. 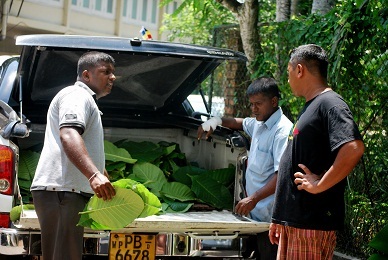 Food was prepared for people in the local area as well as those on pilgrimage to Colombo (Dan Sela – Booth of Noble Sharing). 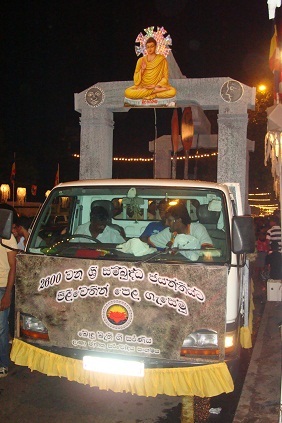 Spiritual songs (Bhakthi Gee – Devotional Songs for the Buddha) were sung as Sarvodaya members were transported around Colombo in a decorated vehicle on the evening of the 17th May. 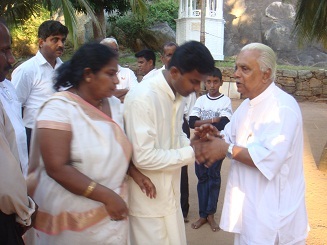 This was continued at the complex of the All Ceylon Buddhist Congress, which had arranged with Sarvodaya to join in the Vesak celebrations. Sarvodaya’s Vesak celebrations extended to the morning of the 19th May when a Dharma preaching program was held in the headquarters. 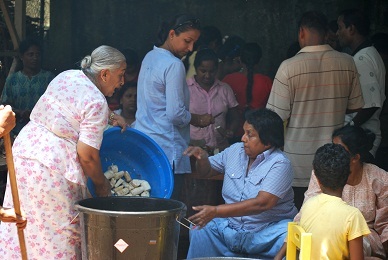 Outside of Colombo, in the Sarvodaya centers and villages, Vesak celebrations also took place under the guidance of the Moratuwa headquarters.